Frank Coenen Sterling Silver Mounted Vest and Gunbelt. Two-piece, matched set by the master saddlemaker and silversmith, Frank Coenen. (a) Stunning black leather, parade vest mounted with heavy gauge, sterling silver repousse floral pattern panels with twisted rope edge, and flowers inset with real rubies. Doeskin lined. Size appears to be something like a men's medium. (b) Ornate sterling-covered black, floral carved gun rig for a Colt Single Action, with repousse holster, twisted rope edge and silver spots. The rig is fully trimmed with rectangular silver conchos and secured via a 3-piece horseshoe buckle set. Vest measures 20" from top to bottom, the belt fits approx a 32" waist. Includes custom stand for displaying both pieces together. Frank H. Coenen, saddlemaker and silversmith extraordinaire, emigrated from Denmark to the USA in the early 20th century entering the saddle business in Southern California in 1906 during that transitionary period between the traditional utilitarian tack of the old west and the rapid ascent of the flashier Hollywood cowboy. A fellow Scandinavian like Edward H. Bohlin, Coenen became one of Bohlin’s chief rivals, producing some of the finest sterling silver parade outfits of the era including the multiple gold-medal winning saddle for the 1939 World’s Fair in New York City. Frank's stunning, heavy gauge sterling silver repousse creations were coveted by the most discriminating Hollywood clientele of the day including Tom Mix, Will Rogers and Wallace Beery. Several of his Coenen's most renowned saddles tell a story or chronicle historical events like his illustrious San Fernando model with its twenty-two completely different cowboy scenes. Lot 574, Brian Lebel's Old West Auction - January 25-26, 2019. Mesa, AZ. 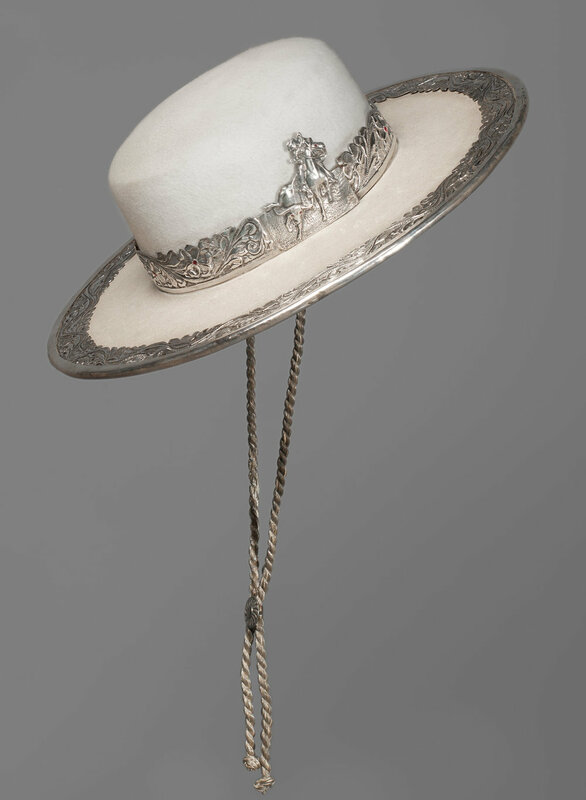 Californio Hat with Frank Coenen Silver Ornamentation. Fabulous 1930s Californio/Bolero style, white fur hat adorned with elegant Frank Coenen heavy- gauge sterling silver floral and vine pattern repousse embellishments inset with rubies. The hat includes a twisted silver rope chin string, original white satin lining and leather sweatband. The exquisite silver hatband is beautifully sculpted and features a vaquero roping a ruby-eyed bull. A divine blend of sophisticated Spanish styling and Danish silver artistry. Exemplary, 100% original condition. Lot 575, Brian Lebel's Old West Auction - January 25-26, 2019. Mesa, AZ. Lot of Five, Frank Coenen Sterling Silver California Parade Saddle Accessories. a) Breast Collar. Stunning Frank Coenen pictorial breast collar, featuring six action-packed repousse cowboy scenes and a double golden-headed Eagle in the center. 32" x 43". A fabulous display piece on its own! b) Cinch. Coenen sterling covered vine and flower repousse pattern ends. c) Stirrups. Pair of Coenen repousse stirrups with rope edge, vine & flower motif inset with rubies. d) Saddle Drape. Heavy-gauge, double-sided, by Coenen, depicting massive and detailed eagle in high relief repousse work on a decorative floral background with silver rope edge. 15" x 17. Includes stand. e) Tassel Drop. Lavish Coenen silver tassel with sterling covered head. Includes stand. Lot 576, Brian Lebel's Old West Auction - January 25-26, 2019. Mesa, AZ. Important Frank Coenen Parade Spurs. Aesthetically breathtaking and extremely rare Frank Coenen double-mounted, California parade spurs. Cheyenne split heelbands, intricate and impressive 60-point rowels, and fully sterling covered with heavy gauge repousse vine and flower designs inset with real rubies. Spurs affixed to matching Coenen straps secured by 3-piece Phillip Fredholm (Los Angeles) buckle sets. Superb, 100% original condition, circa 1930s. Includes custom display stand. Lot 577, Brian Lebel's Old West Auction - January 25-26, 2019. Mesa, AZ. Frank Coenen Silver and Gold Figural Bridle and Bit. Artistically adorned, the bridle features bold three-dimensional gold buffalo heads in the center of the nose and brow bands framed by repousse silver leaves, while the silver chain drop supports oval silver panels with raised silver and gold initials/names and fraternal moon and stars with inset diamonds and rubies. The bridle cheeks replicate the style and imagery of the front panels with the addition of a stately, heavy-gauge sterling silver three-dimensional Indian head with bonnet at each brow. Coenen has utilized a variety of decorative silver buckles, spots and latches to integrate the headstall pieces and support the ornamental Visalia Stock Saddle Company humane bit overlaid with matching silver repousse and gold buffalo heads. Last but surely not least, is the leather split reins and romal with its large, elaborate and adjustable silver slide, mounted with dozens of intricate and decorative flat ferrules separated by miniature rings. Excellent condition. Frank Coenen was definitely not building a range or rodeo bridle 90 years ago when he carefully designed and methodically constructed this very unique, custom show piece. Lot 578, Brian Lebel's Old West Auction - January 25-26, 2019. Mesa, AZ.